Our church web site used to be the sort of thing you mumbled. And you only mumbled after you unsuccessfully tried to “accidentally” give a wrong address at least twice. Now that we’ve revamped things, it’s a bit easier to spit out our URL. But how about you guys–how old is your church site? 38% of you have church sites that are in their prime. They’re not brand new, but they’re not over-the-hill either. That’s good news. But the next 21% of you aren’t so fortunate. Your church site is over 4 years old. You’re hoping to upgrade soon and sell the old one to a museum. 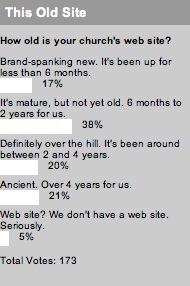 While another 20% of you are knocking on that group’s door with a site that’s 2-4 years old. Just a hair less of you, 17%, have a site that you’ve recently pulled the wrapper off. It still has that new site smell, and you’re loving it right now. Then, a tiny slice of you don’t even have a site. That’s 5% of you, and I’m sure some of you are members of a house church or no church. Those of you in a church with no site, what’s the rub? Is a site in your future plans at all? And for this week’s poll, we want to know: People usually pick a church for one of three big reasons. Which is most important to you? Here’s a naive question: if a church website is continually updated, continues to grow, continues to change and evolve, just what’s the matter with a five year old website, anyway? If a site “continues to change and evolve,” it isn’t old. It works well in current browsers, is built for current users (most of whom have a greater than 800x600px monitor and better than 56k connections), and is much less likely to include a revolving cross gif. For example, my church’s site fits into the 6mo-2yr category, and it’s very nice, but 8 months or so ago it was an embarrassment. It was designed–I kid you not–using Lotus Notes. Invisible text was dropped in between table(!) columns to get them spaced correctly. Half the links were dead. Nothing even coming close to SEO was used. That just doesn’t cut it anymore, especially when the alternative doesn’t have to be expensive. I struggle with that question as well – we just landed into the 6-24 month category and I’m trying to decide whether I should budget for an overhaul in 2/3/4 years from now, or just call it good.